May | 2017 | Welcome to Wreck Beach! Rod Harrison… Celebration of his Life! It is with profound sadness we announce the passing of Rod Harrison while on vacation in Cuba. Predeceased by his parents Raymond (1988) & Carmen Marguerite(2005) Harrison, and Aunts Dorothea Sandercock (1987) Harrison & Daphne Sandercock (2008). Rod leaves behind his dear friends, Allan Kane, Bill McKitrick, Dino Tsiropolous, Lisa Hansen, and Paul Hucul and the BC Kyokushinkai Karate family, as well as many other friends. Rod held many positions including at S.F.U., Dale Carnegie, Burnaby Hospital, Vancouver Canadians Baseball Club and the Government of B.C..
At age 65, Sensei Rod obtained his 3rd degree Black Belt (Sandan) in Karate. He taught Karate at the JCC Kyokuhinkai dojo for 20 years. Rod lived his life based upon the Kyokushin principle: “ We will train our hearts and bodies for a firm, unshaking spirit.” In that he lived this way, may his spirit rest in peace. Rod was a generous and dedicated blood donor who reached 160 lifetime blood & platelets donations. A passionate football & sports fan, Rod was the proud owner of a magnificent painting of a BC Lions football game at Empire Stadium, which will be donated to the BC Lions Hall of Fame in his name. Thursday, June 29th at 7:30 p.m.
Jewish Community Centre: 950 West 41st Avenue, Vancouver, B.C. V5Z 2N7. If you wish, donations may be made in Rod’s memory to the BC Heart & Stroke Foundation. A beach celebration of life date will be announced later. Wreck Beach was Rod’s sanctuary and as such he kept it close to his heart and did not share his love of the beach with his “upstairs” students and associates. Thus, out of respect for Rod, his close friend, Al, has asked that should you attend Rod’s celebration of life at the Jewish Community Centre, that you help keep Rod’s confidentiality about the Beach. At a later time TBA, we will be holding a celebration of life for Rod on the beach. Thank you for your understanding. 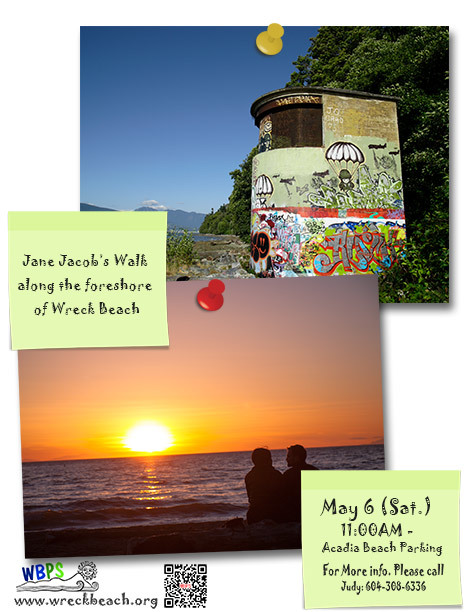 Wreck Beach Day is Aug.7th!! Previously, we announced Wreck Beach Day 2017 was going to be Aug. 1, However, we have to reschedule to Aug. 7(Mon.) . We apologize about the confusion and hopefully see you all on the beach! 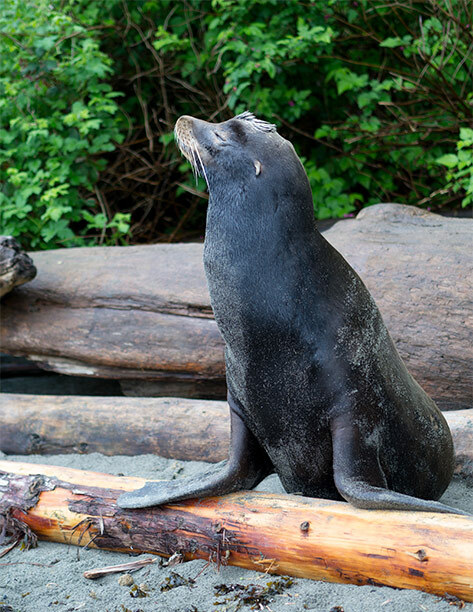 This California sea lion was named Senor Cinqo because the Marine Mammal Rescue folks rescued him from Spanish Banks on May 5. He had been shot twice in the face and has lost one eye and several incisors. He was emaciated when he was found weak and unable to escape his rescuers. He is responding well to treatment but it remains to be seen if he will be able to be released back into the wild. If he recovers, he will need a new home. Whoever the cowardly person who shot him in the face with a small-calibre hand gun was, they deserve to drown in the pee of a thousand camels.